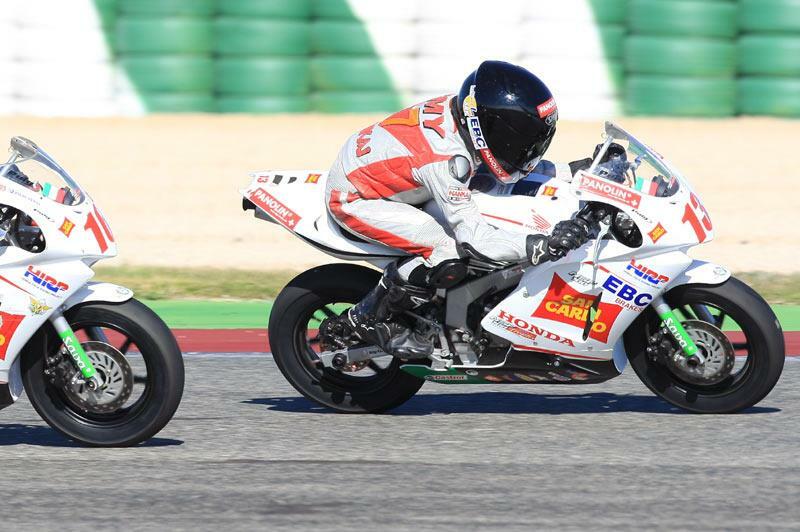 Former GP500 world champion Wayne Gardner’s 12-year old son Remy made his road racing debut at Albacete, Spain as a wild card entry in the Honda Racing Corporation NSF100 Trophy Worldwide Mini Bike series. Remy was faced with a mammoth challenge to familiarise himself with a new 3.5km high speed circuit, and a new bike with a reverse gear pattern, which he had never used before. Thirty-six of the top NSF100 competitors from around the world were entered in the event, sharing eighteen bikes, over two separate sessions. The top nine riders from each semi-final race competed in a final, and the other eighteen riders in a consolation final on Sunday. Remy missed a place in the final by only three places after a thrilling semi-final on Saturday afternoon. He got a great start from the back of the grid, taking two riders on the straight and fighting with a pack of four riders throughout the five lap race to finish at the front of the pack in twelfth position, and seven seconds faster than his qualifying time. Unfortunately it wasn't good enough to make the final race, but he was certainly more confident and determined going into the consolation final. "My first race was so much fun," said Remy. "I just want to keep doing that forever. It's like a drug - you can't get enough of it. I know if I had some more time on the bike I could do better, but I'm just happy to be able to compete with the best in the world," he added. It had been a roller coaster of a weekend from the very beginning, with first practice not going to plan. Remy wasn't aware of the reverse gear pattern until he rode out of the pits, and had a low speed crash on the second lap after confusing the shift pattern. He picked himself up and spent the rest of the session learning the circuit and training himself to work with the new shift pattern. The afternoon session was a little better, and Remy spent the time building his confidence and trying to come to terms with the high speed corners. It was obvious this was an area he had no experience after only training on small circuits and competing in low speed dirt track conditions. Dealing with cold conditions and inexperience in qualifying, Remy's confidence was a little shaken. After a tentative session he finished qualifying last on the grid for the afternoon semi-final race. A little disappointed but very determined to improve, Remy put on his 'race face' and went into the semi-final with a goal to move up from eighteenth place, which he did in style. Remy’s father Wayne was more than pleased with his son’s efforts and said: "I'm so proud right now. This has been a massive challenge for Remy and he's risen to that challenge extraordinarily well. "At the beginning of the weekend I was concerned we might have bitten off more than we could chew, but Remy put his head down and pushed through to a respectable finish. He's certainly proved his tenacity and passion.